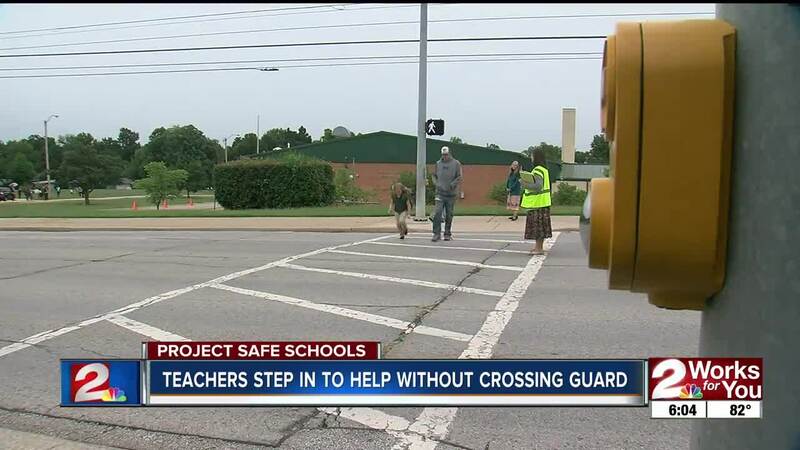 TULSA, Okla. -- It's been six weeks since a crossing guard protected students outside of Patrick Henry Elementary. When the guard fell ill after the first day, teachers started racing out after class to do the job themselves. "Sometimes the crossing lights stop before everyone is across the street. So driver's tend to be in a hurry and they tend to pay attention more to the light than the people in the crosswalks. So us standing there in the crosswalk in our yellow vests tends to be more of a visual for them," 2nd grade teacher Bethany Henretty said. Henretty said in the mornings janitorial duties fall second to the head custodian. Instead, he tries to get everything done later in the day, helping students cross before classes begin. "It's still fairly dark, cars don't slow down when children were having to cross by themselves. Then I saw the janitor would come out and he would try to help in the mornings when he could but that wasn't full time," grandparent Merl Whitebook said. Parents said they've seen children as young as six go through the crosswalk by themselves, and they're concerned when watching many cars fail to slow down. "The crossing guard who didn't come back would tell me "this guy just ran the light" and how concerned he was, and that's from a crossing guard working here. With children walking through here it's just a recipe for a real hazard," Whitebook said. Staff with the city originally thought that guard would come back, but now they're hiring to fill the position. That process could take three more weeks. Once the position is filled, teachers said they still expect to help out. "We have one guard that's assigned to our school for the morning and the afternoon so when that guard has a family emergency or they're out ill then we usually take over at that point," Henretty said. In the meantime, the staff is urging drivers to be aware and slow down.